In a scientific research station at a time when the Earth is experiencing another Ice Age, a team of scientists scramble to stop the encroachment of glaciers over Europe with a device called the ionizer. The station’s manager Clent thinks Europe can be kept inhabitable, but scientist Jan Garrett and the rest believe that soon they’ll have to not only abandon the mission, but the station. Outside a member of the team is conducting research on a glacier and discovers something frozen in the ice. He guesses that it’s a warrior from a forgotten prehistoric civilization and another scientist dubs him “the ice warrior.” Meanwhile the TARDIS arrives and instantly gets stuck in a snowstorm. After getting out, the TARDIS crew sees two militantly Luddite scavengers, Storr and Penley, the latter of whom used to be a scientist working at the very same station, take food and supplies from the station. After jaunting inside the base, the Doctor impresses Clent with his useful advice about the ionizer and is asked to help make the ionizer fully functional after the Doctor passes a scientific pop quiz. An avalanche kills a member of the research team outside and causes Storr to break his arm. Nonetheless, the frozen body is bought in and left to melt. 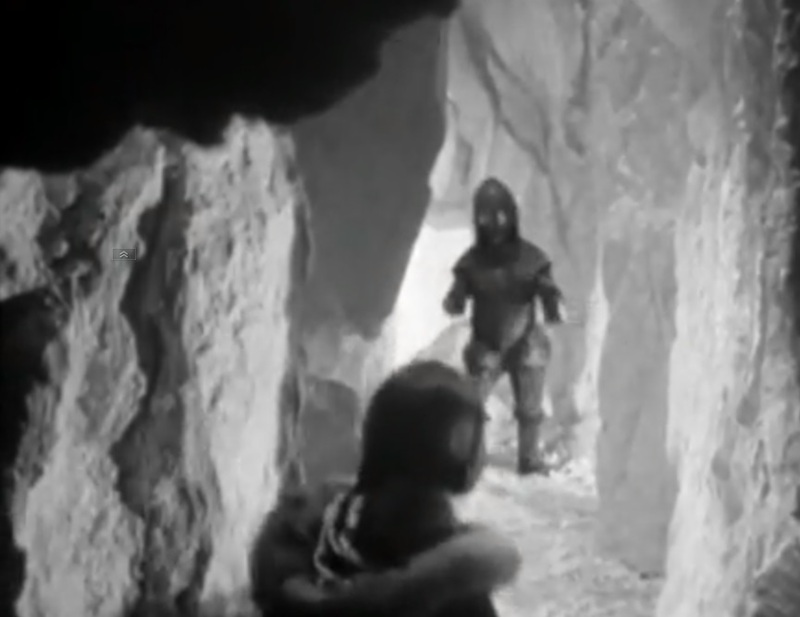 The Doctor examines the body and rushes out to warn Clent that the frozen body’s supposed stone age helmet is actually an advanced space helmet. While the Doctor is gone, the Ice Warrior comes alive, attacks Jamie, and abducts Victoria. Holding her captive in a storage closet, Victoria learns the reptilian Ice Warrior crash landed on Earth with a crew from Mars, before the Ice Warrior interrogates her and decides to try to recover and resurrect his own crew. The Doctor and Jamie are dismayed that Clent and Jan rely on diagnostics generated from computers, even when dealing with an emergency situation like the revival of the Ice Warrior. Also the team at the station decides to send Jamie and one of the scientists to save Victoria and learn the nature of the Ice Warriors’ spacecraft’s engine, which if hit by the ionizer could trigger a nuclear chain reaction. The Ice Warrior forces Victoria to help him try to revive his crew with the station’s technology and knocks Clent unconscious when he tries to stop him. The Doctor runs into Penley getting medicine from the best for Storr and unsuccessfully tries to convince him to stay and help with the ionizer, and later he learns from Clent that Penley did not just defect but had suffered a breakdown. In the meantime, the Ice Warrior succeeds in finding and resurrecting his comrades. Jan attempts to force Penley to return to the base to help, but is overpowered by Storr. However, Penley gives her a clue to pursue in his notes. With what Jan mines from Penley’s calculations, the Doctor is able to get the ionizer working. although the Ice Warriors’ engine is still a possible threat. Out on the glacier, the Ice Warriors kill the scientist and wound Jamie, who is rescued by Penley. Finding their ship buried in a cave deep in the glacier, the Ice Warriors work to repair it. While they debate over whether or not to kill or further interrogate Victoria, she escapes, but while trying to elude a pursuing Ice Warrior she gets caught in an avalanche. Meanwhile the Ice Warriors plot to invade the station and loot it for fuel, while also assuming that the ionizer is a weapon to be used to destroy them. Victoria is “saved” by Storr, who set out to try to negotiate with the Ice Warriors and drags Victoria with him. Victoria is recaptured and Storr is murdered for his trouble. Armed only with a gas he deduces would be toxic to the Ice Warriors yet harmless to humans, the Doctor heads over to the Ice Warrior ship to get information on their engine. The Doctor tries to reason with the Ice Warriors, but they refuse to cooperate, believing that even if the ionizer doesn’t cause their ship to explode the melting glacier would flood their engines, trapping them on Earth, and they take away the Doctor’s communicator, leaving Clent and Jan without enough data to make sure it’s safe to use the ionizer. Penley and a recovering Jamie return to the base, and Penley pushes Clent to use the ionizer even without the data to no avail. The anxiety over whether or not to use the ionizer is ended by an Ice Warrior invasion. Back on the ship, the Doctor knocks out the one Ice Warrior left behind with the toxic gas and adjusts the ship’s sonic canon to be (somewhat) harmless to humans before firing it on the station, which, along with Penley boosting the station’s heat, forces the Ice Warriors to retreat. The Doctor and Victoria leave the ship for the base, but not before sabotaging the canon. Penley takes control of the ionizer and fires it at the glacier, which destroys the Ice Warriors’ ship without causing a nuclear explosion. The crisis solved, the Doctor, Victoria, and Jamie slip away as green growths appear in the melting snow. There’s only one vague hint about exactly when this story takes place, but based on just that humanity is due for a (man-made) Ice Age by some point in the fifth or sixth millennium. The global warming deniers will (very, very eventually) be right! With this episode we get another iconic enemy alien species, the Ice Warriors, who also made an appearance in the 2005 series – and it’s not until then we see them without their helmets. Besides the first appearance of the Ice Warriors, this serial is probably best known for one of the most glaring science errors in the show’s history, which is really saying something for the franchise that still defines “soft sci-fi.” The Second Ice Age is – explicitly and at length – said by the Doctor and Clent to be caused by “a severe drop in the carbon dioxide level in the Earth’s lower atmosphere” which was caused when humanity completely replaced agricultural production with technologically generated artificial food, which (for some reason?) meant that “the amount of growing plants on this planet were reduced to an absolute minimum,” to which the Doctor notes, “No plants, no carbon dioxide.” Caught that? Not to brag, but even a dunce like me who hadn’t taken a science course since my senior year of high school noted the tiny flaw that plants actually use up carbon dioxide, meaning in this scenario the planet should actually be warmer. And, anyway, who thought it would be a good idea to wipe out most plants? I get that the implication that humanity just gave up growing crops, but did that necessitate just shrugging and declaring, “Screw the rainforests!” and going to town on most of the planet’s wilderness? I know that classic “Doctor Who” ditched its educational mission almost toward the beginning and tended to be written and produced on the fly, especially by modern standards, but you’d think someone along the line would have caught messing up one of the first scientific facts children are taught in school. Maybe given how much the plot hinges on the wonky science it wasn’t worth the headaches from a deep rewrite, but I can’t help but feel bad for the elementary school audience who got terribly confused when the brilliant Doctor they loved contradicted their textbook or their science teacher. Sorry, I probably shouldn’t have harped on that but there isn’t too much else to say. It’s an average “Second Doctor in an isolated base attacked by monsters” story. The plot tries to build up to a moral about not becoming dependent on technology while not ignoring the benefits of science, but it gets muddled when the climax comes down to little more than blind luck. It’s still a fun story that doesn’t rely quite so much on padding (with the big exception of poor Victoria getting captured twice) as other serials from the show’s early eras, with a couple of great moments like the Doctor making his calculations for the ionizer by crawling around and rummaging through his own discarded, crumpled-up notes and scribbling numbers on the floor. Plus the serpentine design of the Ice Warriors is simply classic. Still, besides its contribution to continuity by introducing the Ice Warriors, it’s not essential viewing for those making a tour of the Second Doctor era. Even more so than other projects targeted toward a large fanbase, Gotham was getting bad word of mouth as soon as the news of the series was announced. Of course there was the usual skepticism about prequels, but also the idea of a Batman series without Batman or of Smallville in Batman clothing. All things considered, though, Gotham is a stronger concept for a prequel than Smallville. Focusing on the rise of Detective Gordon through a decadent police department, on Gotham’s notorious corruption, and on the ugly transition from traditional organized crime to super-criminals is a much richer and more natural mine for stories than what Smallville had, which did draw from the teenage Lex Luthor-Clark Kent relationship but had to resort to monsters-of-the-week and later to shoveling in as many DC Comics characters as possible to generate episodes. It helps that the comics have already delved into most of these regions of the Batman mythos, with classic stories like Batman: Year One and The Long Halloween as well as a series focused on the Gotham police department, Batman: GCPD. Centering the series around an already weary but irrepressibly ethical James Gordon first getting his glimpse of the machinery of corruption that runs Gotham City was a wise move, providing lots of possibilities for story arcs that can touch on the mythos without turning the series into Young Batman versus Teen Joker. That said, what did give me pause was the decision to include several members of the rogues gallery. I get that it was inevitable, necessary to please both fans and the studio. 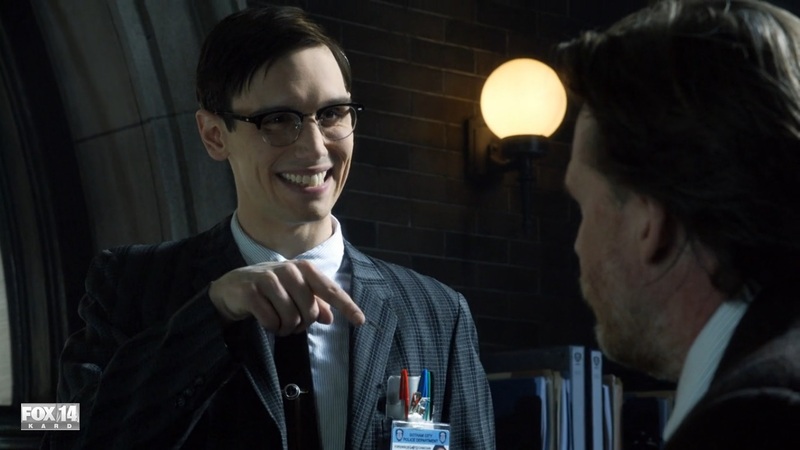 And I will admit that the debut of a young Oswald Cobblepot (Robin Lord Taylor) as a lowly but ambitious mob lackey works quite organically, and the appearance of Edward Nygma (Cory Michael Smith) (which here amounted to little more than a cameo) does promise some interesting developments later. Also it’s not a bad idea on the face of it to include an adolescent Selina Kyle (Camren Bicondova), especially if we get to follow her evolution as a master-thief, but already the pilot tries too hard to tie her in with Bruce Wayne (David Mazouz). Even worse is the inclusion of Poison Ivy (Clare Foley) as a little girl, who gets connected, albeit loosely, to the murders of Bruce Wayne’s parents in a way that begs suspension of disbelief even more than a millionaire who dresses in a bat-costume to fight genius psychopaths. It does make me fret that, especially if the series lasts for at least a few seasons, we’ll end up with the Scarecrow as Bruce Wayne’s child psychologist or the Mad Hatter as James Gordon’s eccentric neighbor. Still, my overall view of the series is “cautiously optimistic”, largely because the pilot was pretty smartly written. There’s a few great little moments like Detective Bullock downing milk of magnesia while eating in a cafe and Edward Nygma having an elaborately scribbled notebook that hints at his insanity even more than his dialogue. But most of all was how well the characters who weren’t Bruce Wayne or Alfred or the future rogues were depicted. Jada Smith already looks like she’ll be a quality antagonist as the mob lieutenant Fish Mooney, even if the laws of the prequel indicate that she’ll be doomed eventually. Detective James Gordon (Ben McKenzie) is, like his comic counterpart, a good cop in a rotten department, but he’s also a character the script isn’t afraid to force into a few ugly choices. Probably the most surprisingly developed character is Harvey Bullock (Dolan Logue). In a lot of adaptations Bullock is at worst comic relief or at best a foil for Gordon and Batman, but here the script and Dolan Logue present him as a fundamentally well-meaning cop who nonetheless became fully integrated into the corrupt system long ago. Together with Renee Montoya (Victoria Cartagena) and Crispus Allen (Andrew Stewart-Jones), one gets a portrait of a team of cops who are “good” in the sense that they want to do their jobs but who also see no alternatives to playing the system as it is, potentially making their dynamic with Gordon the would-be reformer even more interesting despite the fact that fans already know where all this is headed overall. 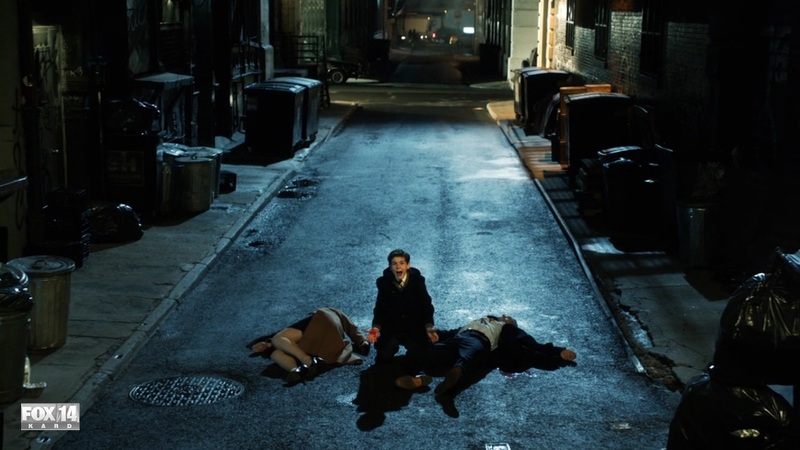 With the exception of Oswald Cobblepot, the appearances of the future rogues is still a weak point in an otherwise solid story, especially because the script is blatantly much more interested in how Gordon and Bullock handle the Wayne murders than in setting up the rogues or even spending much time with young Bruce Wayne. Still, that’s what having a television series is for, and despite my misgivings I will be tuning in (which may not be accurate technically but sounds so much better than “logging in to Hulu”) to see where this particular take on one of my own favorite franchises is headed. The pitch: She-Devil crossed with The Abominable Dr. Phibes, as filtered through the mind of the recently departed Joan Rivers. Relatively long before she would guest host The Tonight Show and eventually head the first (and so far last) late night talk show hosted by a woman, Joan Rivers wrote the story for and co-scripted a made-for-TV movie, The Girl Most Likely To… The ’70s was, believe it or not, a golden age for TV movies. Rather than sleazy exposes on nearing-the-last-of-their-five-minutes celebrities or biopics of tabloid criminals, these were movies with creative ambitions that transcended their often skimpy budgets. You got Look What Happened to Rosemary’s Baby…er, my mistake. I mean, there was Killdozer…okay, that’s not right either. Well, alright, like with anything there were some oddballs and duds, but there were genuine classics that at least nearly rivaled Hollywood like Helter Skelter, a Dracula adaptation written by Richard Matheson and starring Jack Palance, the Steven Spielburg directed Duel, the still fondly remembered horror anthology Trilogy of Terror…in an age before home video, it wasn’t a bad substitute. 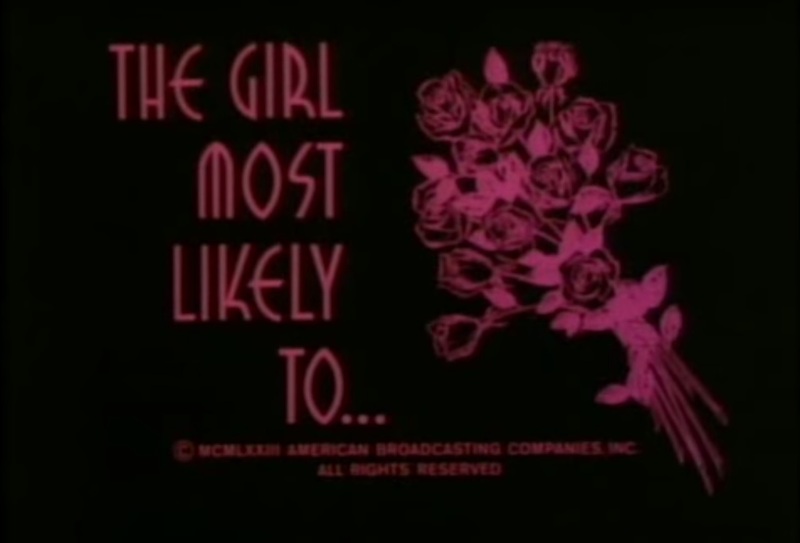 The Girl Most Likely To… is a pitch black comedy that follows the trials and tribulations of Miriam Knight (Stockard Channing! ), an unattractive and witty Jewish girl who, as the old sexist joke goes, just wants to go to college to earn her MS degree. The only problem is, no matter how many diverse classes she takes and how many schools she transfers to, she can’t even get a date or make any female friends. Also it doesn’t help that her childhood friend her family wants her to marry, Herman (Warren Berlinger), doesn’t want anything to do with her either. 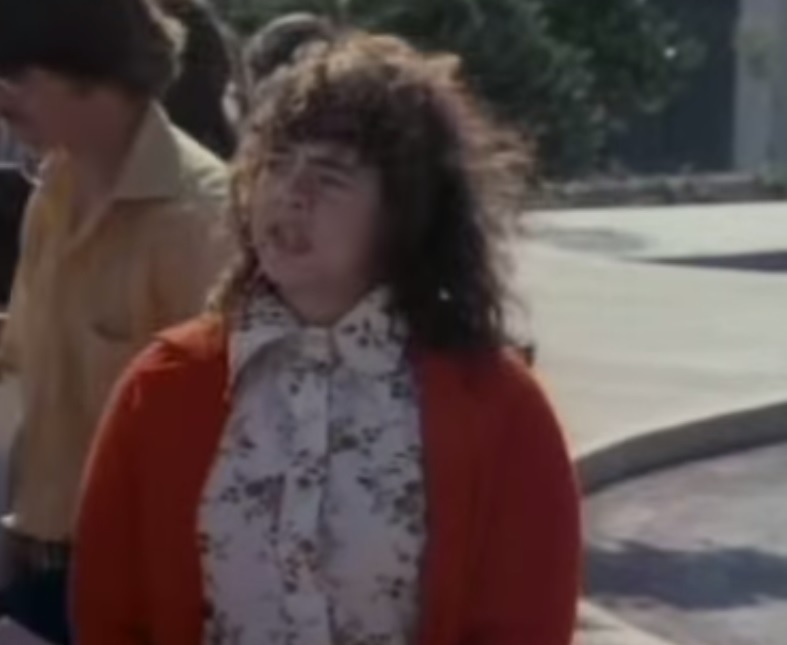 Even worse, at the university she just started attending, people are more hostile than ever, especially her cheerleader roommate Heidi (Susanne Zenor) and a football star she’s roped into tutoring, Moose (Larry Wilcox!). When Heidi deliberately turns a rare moment of triumph for her into a public humiliation, Miriam speeds off campus in a car, causing a head-on collision. Here the movie shifts gears, as plastic surgery has turned Miriam into a seductive bombshell, giving her an anonymity and sexual firepower she plans to use to have her homicidal revenge; that is, if a police detective (Ed Asner!) doesn’t stop her. Joan Rivers’s voice permeates this thing, especially echoing through Miriam’s self-depreciating narration and various snippets of dialogue. There are lines like Heidi casually mentioning, “When I was engaged to him, his wife became pregnant again, so I figured he wasn’t sincere.” Or Miriam narrating, “My homely cousin Sheila didn’t have any [friends or dates], and she lived a full and happy life, right up to the day of her suicide.” Really, it invites anyone familiar with her style, especially her (in)famous fixation on fashion and physical appearances, to play psychoanalyst. After all, the first half of the movie is about a lonely, frustrated young woman who tries desperately to compensate for her inability to make friends or attract romantic attention with humor and self-depreciation. As exaggerated as Miriam’s torments are, there are a couple of uncomfortable moments that I think would ring true for many former and current social misfits (myself included), such as, when a medical intern humiliates Miriam in front of a crowd of his peers as part of a hazing ritual, she cheerfully dances and bows before the cheering men even as inside she reels from the horror, betrayal, and humiliation. But putting aside the later career of Joan Rivers (especially things like her participation in the truly loathsome show Fashion Police), this movie has interest even if one is not a fan (or hater) of Rivers. Admittedly the second half of the film, despite seeming to promise richer material, is weaker than the first. It doesn’t quite strike that balance of farce and darkness as deftly as the first half, and Miriam’s revenge schemes somehow are rushed through too quickly without truly feeling cathartic or tragic. On the whole, though, I would deem this one of the more ambitious and successful black comedies I’ve seen, and I know I’m not alone, since it is the rare TV movie from the past to get a relatively recent DVD release (although of course it’s also available on YouTube). It’s definitely worth checking out especially for fans of TV movies from the era or of Joan Rivers. 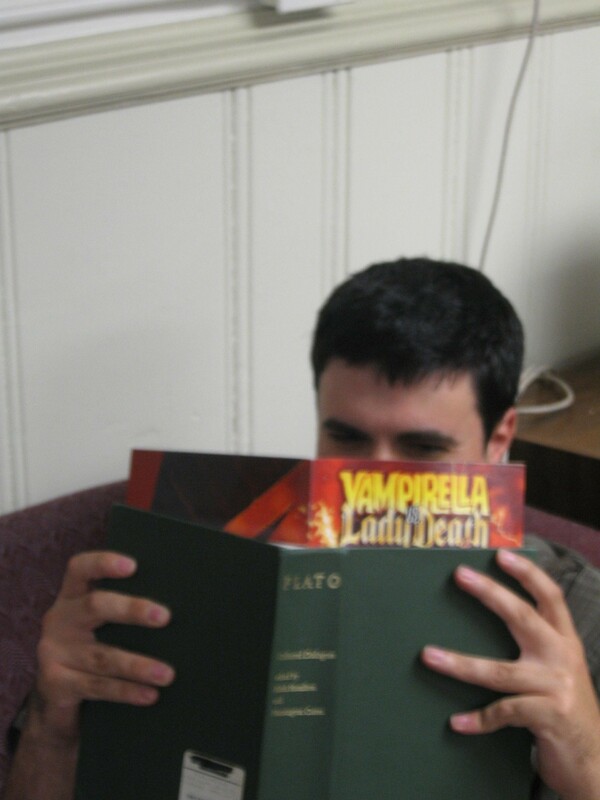 Or if you just want to see the closest thing to a female version of Dr. Phibes out there. “You’re not sending me to the cooler,” he said. If you thought lines like that fell as flat as year-old soda coming from the lips of an actor with a heavy Austrian accent, imagine just seeing them on the naked page. Somehow it makes the characters’ actions even more inexplicable. It’s like everyone in Gotham City is suffering from a particularly pitiful version of Tourette’s. Truly a villain motivated by grief and revenge. Batman went for Freeze. Robin was right behind him. How dramatic, thought Freeze. How inspiring. His own outlook tended to be more down to earth. More succinct. To be fair, that still does more with Freeze’s modern reinvention as a tragic villain than the movie’s script ever does. It really does get at, let’s say, one slight quibble with the film and the way it approached the source material. It wanted to acknowledge modern versions of the characters, but at the same time it was trying to homage the campy ’60s TV show and the Silver Age style it was built on. The problem emerged when it tried to have a Mr. Freeze who acted along the same lines as a bald Vincent Price throwing egg bombs and sneering lines like, “Egg-celent” at the exact same time it would present a Mr. Freeze with largely the same tragic backstory as the updated animated series incarnation. You can’t blame the author by not delving into this Freeze’s mindset. To reconcile the two radically different versions of his character, he’d have to have the worst case of Multiple Personality Disorder this side of a soap opera. Anyway, like in the movie, Mr. Freeze steals a gem from the museum and makes a big budget escape in a rocket. When Batman manages to catch it, Freeze handglides away, leaving Batman stuck in a rocket that threatens to hit the city, culminating in the rather infamous “wind-surfing on two metal doors” scene from the film. But would it be enough? Would they reach the villain in time to get the museum’s diamond back? Batman gritted his teeth, knowing there was only one acceptable answer to the question. Batman does succeed – almost – but Robin, always the useful human shield, gets between Batman and a blast from Freeze’s gun. Naturally Batman chooses to save Robin, which earns him Freeze’s scorn.